Buick sold 19,351 Enclaves in the U.S. through April. DETROIT -- General Motors dealers are heading into one of their busiest weekends of the year unable to deliver some of their most popular vehicles: large crossovers. 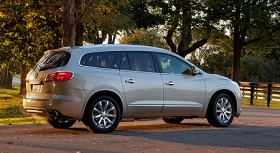 GM is recalling 1.3 million Buick Enclave, GMC Acadia and Chevrolet Traverse crossovers from the 2009-14 model years to fix a front seat belt cable that can wear out and eventually fail, increasing the risk of injury in a crash. GM told dealers on Monday that they can't sell any of the vehicles to customers until they're fixed. The required parts "are not available at this time" and GM has not said when they will be ready. That raises the likelihood that about 68,000 new large crossovers on dealership lots or en route to stores (as of May 1) will be sidelined for the last-weekend-of-the-month sales push -- one in which many dealerships have planned Memorial Day promotions. GM’s U.S. sales through April were slightly more than even with the same four months of 2013, with Buick leading the way with an 11 percent gain. The total U.S. market gained 3 percent. Dealers still can close sales without delivering the recalled vehicles. But that will be difficult without test drives. GM spokesman Alan Adler confirmed that dealers are asked not to use vehicles subject to stop-sale orders for "demonstration purposes." “That makes it tough on new car sales,” said David Westcott, owner of Westcott Buick-GMC in Burlington, N.C. Westcott said he also has 15 to 20 used Acadia and Enclave models that can't be moved until they're inspected and fixed. David Ferraez, dealer principal at Green Brook Buick-GMC in Green Brook, N.J., said he has 170 Acadias and Enclaves on his lot. The crossovers are the highest-volume nameplates at his store. Ferraez said he plans to "aggressively work deals and sell them" even if the crossovers can't be delivered until they are inspected and fixed. His staff will offer loaner vehicles for buyers who want or need to get into a new car. "We can't be out of business with our No. 1 product in one of our busiest times of year," Ferraez said. "I'm nervous about it, but we'll be proactive." GM also told Cadillac dealers to stop selling the redesigned 2015 Escalade pending a fix to a problem with the passenger side airbag. Adler said the Escalade SUVs and the crossovers are being held at their plants for repairs before being shipped to dealerships. GM today rolled out an end-of-the-month dealer bonus program "to help retain our sales momentum and close May strong," a bulletin sent to Chevrolet dealers said. The program will pay up to $1,000 in dealer cash for retail sales of 2013-15 Chevy models sold through June 2, excluding 2014 Corvettes and SS performance sedans. Buick-GMC is running a similar program, dealers said. Some dealers say they're worried about the cost of keeping extra inventory that can't be moved pending the recall fix. Detroit Chevy dealer Ralph Shaheen says he has about 40 new Traverse models on his lot and another six in his used fleet. He said he'll be paying extra floorplanning costs unless GM reimburses him for that expense. “My first question to my zone manger will be, ‘Where do you want me to send the bill?’” said Shaheen, president of Shaheen Chevrolet in Lansing, Mich.
John Spellman, general manager at Bill Kay Buick-GMC in suburban Chicago, said his dealership has more than 60 new and used Acadia and Enclave models, which he calls "a big seller for us." "Nobody is thrilled about it. It's a big weekend," Spellman said. "But I understand what [GM] is doing. Nobody wants to be in the position of putting a car with problems out there. So we're going along with it."